And they sound really good, too. Usually, planar magnetic headphones aren't the most portable cans. 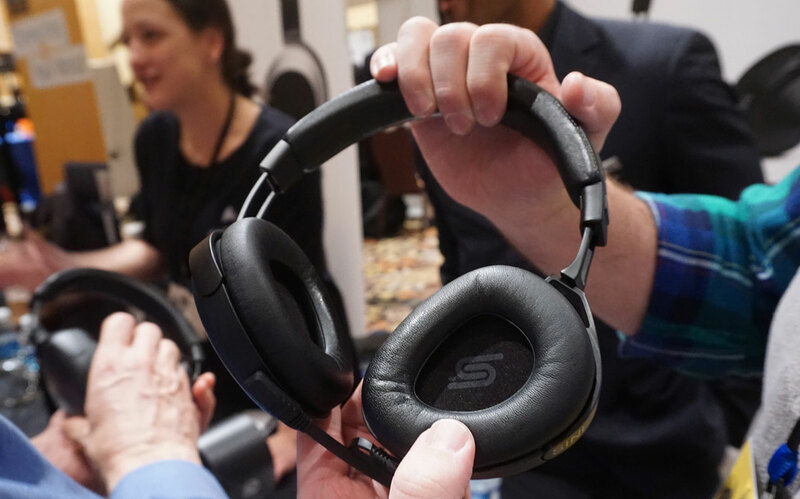 At this year's CES, Audeze unveiled its much more portable Sine planar magnetic on-ear headphones. What does that mean exactly? Well, the planar magnetic tech uses a thin diaphragm rather than typical headphone drivers, touting higher accuracy and more detailed sound. These particular cans are also lightweight and don't pinch in on your head, which sometimes can be a struggle, especially with the extra heft you have when dealing with audiophile-grade headphones. Sine also employs a Lightning cable to pull the audio from an iOS device. While we've seen that feature before, it's still far from the norm. That connection allows for 24-bit audio, and the cable houses a built-in signal processor and digital-to-analog converter to keep things sounding top-notch. We gave the headphones a brief listen and came away quite impressed. During a smattering of John Mayer, the Black Keys and Childish Gambino (to cover a variety of genres, natch), the Sine showcased stellar clarity, crisp highs and a respectable amount of bass. Overall, the sound quality is on point, if you're willing to spend $500 on a set of wired headphones. With wireless cans being all the rage these days, Audeze may be a tough sell for some. However, folks who are after sound quality and are familiar with the planar magnetic components should give these a look. Yes, they're wired, but the audio makes up for the tether.